The Attukal Bhagavathy Temple, one of the ancient temples of South India, is popularly described as the Sabarimala of Women. Attukal Bhagavathy Temple is renowned for annual Pongala festival, in which over a million women participate. Preparation of a comprehensive and integrated development Plan for Attukal region with special emphasis on Urban Infrastructure development of the region and pilgrim facilitation and preparation of DPR’s for selected projects. 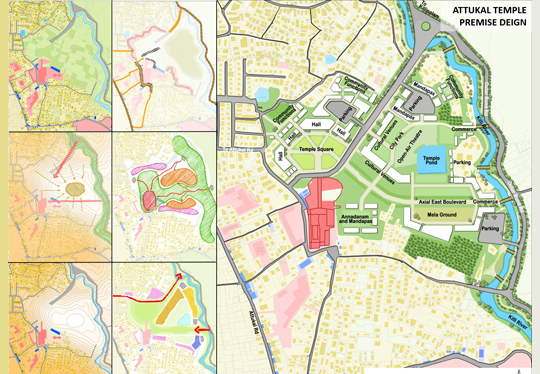 Attukal Master Plan work is dealt in 3 scales for site specific detailed design and planning of the area. 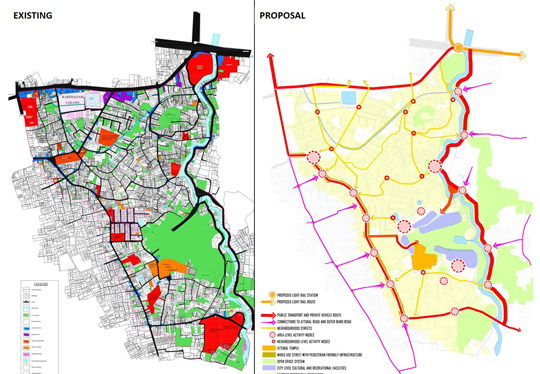 The scheme area for the project is 29 wards. To undertake Preliminary surveys and field visits to identify the key infrastructural issues pertaining to traffic management, parking, sanitation, urban drainage and other environmental and developmental issues of the region. To conduct Stake holder surveys and to collect feedbacks to identify the issues form people who will be actively taking part in the region, right from the pilgrims, land owners, developers, and State Government. To develop guidelines and policies for the overall and integrated development of the region.